Discussion in 'Tutorials' started by laurie9300, Jul 7, 2015. I intend this to be the "go-to" reference for all Vaping terminology! To achieve this I am to going to need your help. I intend to keep this thread maintained and as up-to-date as I can (time permitting). I do not intend to include any brand names. If you have any suggestions on how I can improve it, please post. If you find any mistakes, please post. If you have a better definition for an entry, please post. If you think an entry would benefit from including an image, please post. If you have a term that needs to be included, please post. If you can include the definition, even better! Cat, Arnie, emu and 5 others like this. Usually the size of a large pen. Has a larger and longer lasting battery than cig-a-likesand allows users to customise e-liquids when refilling. 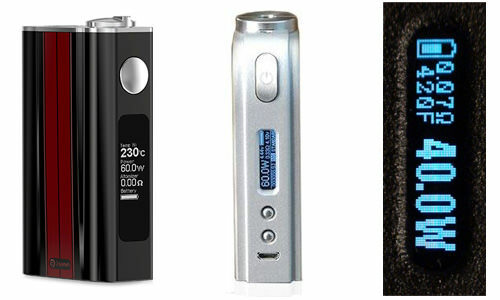 Third Generation Personal Vaporisers usually consist of a mod (the battery and electronics housing) which has variable voltage and/or variable wattage. (See Advanced Personal Vaporiser (APV). Fourth Generation Personal Vaporisers have many of the same features & advantages of 3rd generation devices while incorporating Temperature Protection in these devices. One of the many styles of atomisers available. 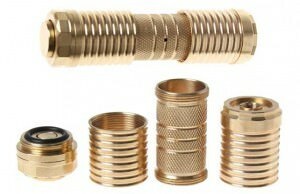 It is a 510 threaded atomiser with low resistance. 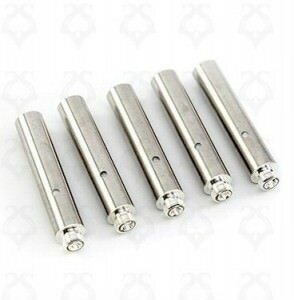 The most common thread connection for mods and atomisers. Mods have a female thread and atomisers have a male. The thread is M7x0.5. Lithium-ion battery (14mm in diameter x 50mm in length). Lithium-ion battery (16mm in diameter x 34mm in length). Lithium-ion battery (18mm in diameter x 35mm in length). Lithium-ion battery (18mm in diameter x 49mm in length). Lithium-ion battery (18mm in diameter x 65mm in length). Lithium-ion battery (26mm in diameter x 65mm in length). A chemical found in cigarette smoke as well as some e-liquid flavourings. Acrolein is produced when e-liquid is heated to incredibly high temperatures. Linked to lung cancer in analog cigarette use. Strong irritant to skin, eyes, and nasal passages. Used to connect atomisers and mods that have different threads. See entry under All Day Vape. Third generation personal vaporiser. The APV usually consists of a mod which includes electronics to add extra features. 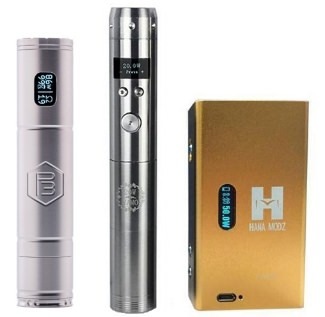 These features may include a screen, various safety features, variable voltage and variable wattage. See entry under Air Flow Control. See entry under Aqueous Glycerine. A device that has both the mod & atomiser integrated into a single unit. 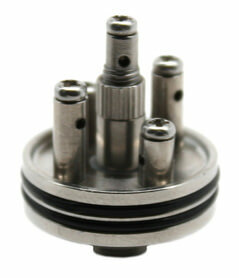 An adjustable orifice built into an atomiser or mod designed to regulate the airflow over the coil(s) in an atomiser. Your All Day Vape is the e-liquid you enjoy so much that you can vape it all day without changing flavours. See entry under Electronic Cigarettes. A standardised wire gauge system used predominantly in North America for the diameters of round, solid, non-ferrous, electrically conducting wire. The standard unit of measure of the rate of electron flow or current in an electrical circuit. See Entry under Advanced Personal Vaporiser. Vegetable Glycerine that has been diluted by about 20% with de-ionised or sometimes distilled water. A non-profit organisation that advocates tobacco control. Branches in the UK, New Zealand, USA and Australia (inactive). Some support vaping and some are opposed. Is a campaigning public health charity that works to eliminate the harm caused by tobacco. It is not anti-vaping. Action on Smoking and Health: Is the independent Scottish charity taking action to reduce the harm caused by tobacco. ASH Scotland’s vision is of a healthier Scotland, free from the harm and inequality caused by tobacco. It is not anti-vaping. An e-liquid that, in your opinion, tastes disgusting. The component of a Personal Vaporiserwhich causes e-liquid to turn into a vapour. 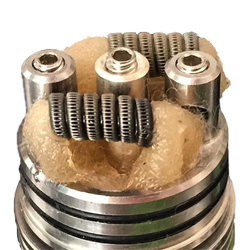 Contains one or more coils of resistance wire, a variety of wicking materials and comes in a multitude of formats depending on the device. These include clearomisers, cartomisers, RDAs and RBAs. Replacement wick and coil assembly for a clearomiser. The component of an atomiser that holds the e-liquid. A Personal Vaporiser that is activated when the user puffs rather than by pressing a button. A safety feature integrated into a Personal Vaporiser that temporarily turns off your battery when the button is held down for more than ‘x’ amount of seconds. See entry under American Wire Gauge. See entry under Bricks & Mortar. See entry under British American Tobacco. A battery that you can recharge. A mod that has a built in battery. Usually refers to an eGo style battery but applies to any Mod that has a non-replaceable battery. See entry under Bottom Coil Clearomiser. See entry under Bottom Dual Coil Clearomiser. Also referred to as Big Tobacco, this is the term used to describe the corporations that primarily manufacture cigarettes and other tobacco products. Big Tobacco has also purchased and invested in a few cig-a-like companies which has been the subject of controversy spurred on by ANTZ. The circuitry of a regulated mod that allows it to fire above battery voltage. A clearomiser in which the coil sits at the bottom of the clearomiser tank. A clearomiser with the coil at the bottom a glass tank. A clearomiser which has two coils in parallel at the bottom of the clearomiser tank. A bottom feeding mod has a juice bottle contained within the mod. This feeds a bottom feeding dripping atomiser through a hole in the 510 connector. It gives the results of dripping without the need to carry a separate bottle. A Personal Vaporiser that is manufactured in a box-style enclosure (mod) rather than a tube. See entry under Big Pharmaceuticals. A physical, real world store that sells Personal Vaporisers and associated equipment including e-liquid. See entry under Big Tobacco Companies. The circuitry of a regulated mod that allows it to fire below battery voltage. An arrangement of coil/s and wick/s in a rebuildable atomiser. The part of an Atomiser that accepts the build. Cpaella. A manufacturer of flavour concentrates used in e-liquid. See entry under Cartomiser Punch. A combination of a disposable cartridge and an atomiser. 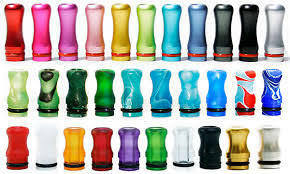 It is typically made of a stainless steel tube filled with poly-fil surrounding an atomiser coil. It can be used as a ‘stand-alone’ atomiser or, when punched, used in a cartomiser tank. A cartomiser that contains two coils in parallel. A cartomiser that contains a single coil. A device used for punching holes in cartomisers when they are to be used in atomiser tanks. A tank designed to house a punched or slotted cartomiser and then filled with e-liquid. The e-liquid is fed to the cartomiser through the holes. Typically a mouthpiece made of plastic that houses a filler material to hold e-liquid. 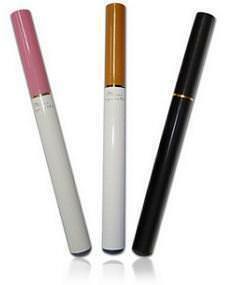 Predominantly used on cig-a-like style Personal Vaporiser, they can be empty or pre-filled. USA based lobby group for vaping. See entry under Drip Well. A medicine which helps adults to stop smoking. It can help to reduce the cravings and other withdrawal symptoms which occur while you give up smoking. Many negative side effects have been linked to it’s use. A Personal Vaporiser designed to look like a real cigarette. 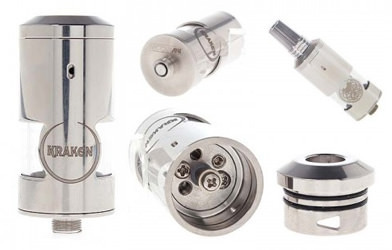 A low cost tank atomiser with a clear tank usually featuring a replaceable pre-made coilsystem. Large volumes of dense vapour. Someone who enjoys producing large volumes of dense vapour. The right combination of Mod, battery, atomiser and e-liquid are required to achieve good results. Competitions are even held to see who can "blow the biggest clouds". Coils are made from a variety of materials including Kanthal, Nichrome, Nickel and Titanium. The wire is then wound into a cylindrical shape. It heats when a current is applied, and is used to vaporise e-liquid. 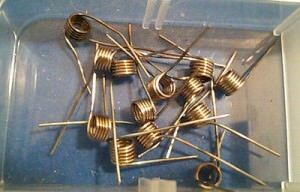 Many vapers choose to build their own coils but they can also be bought pre-made. The overall output of a coil is determined by Ohm’s law. Concentrated flavourings that are added (much like a recipe) to a base liquid in order to achieve certain flavours and produce an e-liquid which is ready to vape. See also entry under Do It Yourself. A coil that is wound such that all the winds are touching or in contact. A popular wicking material available in a variety of forms, including sterile and organic, balls or pads. Cotton is a soft, fluffy staple fiber that grows in a boll, or protective capsule, around the seeds of cotton plants of the genus Gossypium in the family of Malvaceae. 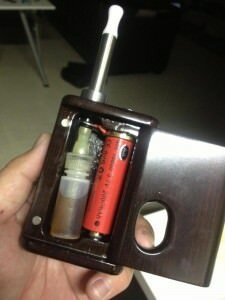 A Personal Vaporiser which has been hand made or modified. See entry under Automatic Shut-Off. See entry under Dual Coil Cartomisers. See entry under Dual Coil Tank. The flat base area where the positive and negative posts sit on an RBA/RDA. The act of removing the wicking material from the coil(s) in an atomiser. Diacetyl is a flavoring used in some e-liquid production for it’s buttery flavor. Can cause Bronchiolitis obliterans (otherwise known as Popcorn Lung) if inhaled in large concentrations. Many e-liquid vendors have stopped using it. See entry under Electronic Cigarette. 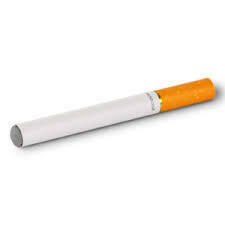 A ‘cig-a-like’ designed to be used until all the e-liquid has been exhausted and then discarded. See entry under Do It Yourself. DNAs are a range of small variable wattage boards designed by the Evolv company. They are used in both handmade and mass produced mods. The art of making your own e-liquid from raw ingredients. See Entry under Drip On-Demand. The (Australian Government) Department of Health. E-liquid sold without nicotine and with double the flavour strength plus VG or PG. Designed to be mixed 50/50with nicotine base. e.g. 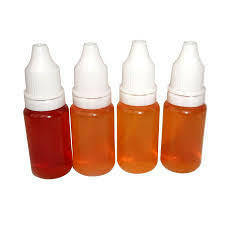 10 ml of 48mg unflavoured nicotine liquid mixed with 10 ml of doubler to produce 20ml of 24mg e-liquid for vaping. To drip drops of e-liquid into an atomiser. The mouthpiece of an atomiser. The name originates from a mouthpiece with an opening that allows drops of e-liquid to be dripped directly to the atomiser/cartomiser without the removal of the tip, but now applies to the mouthpiece of any atomiser. A cup shaped recess on the top of a mod where the atomiser female connector sits. The drip well is designed to catch any excess e-liquid that may have leaked from the atomiser. An atomiser that has no tank to hold e-liquid. It designed to have e-liquid dripped directly the wick and coil. They can be disposable or rebuildable. A technique for cleaning a used coil. It involves purposefully firing an atomiser on a battery without e-liquid which results in the heating up and glowing of the coil. This allows for cleaning of the coil by burning off impurities. The very unpleasant experience received when there is not enough e-liquid to keep the coil wet and cool. It results in a very bad tasting, hot vape that can burn your throat. It is caused by either running your atomiser dry or by poor wicking to the coil. A large cartomiser tank used to house dual coil cartomiser. E-Cigarette Forum The world's largest vaping forum. See entry under Electronic Cigar. See entry under Personal Vaporiser. An essential tool for calculating your nicotine strengths, PG/VG ratios, or any desired combination to suit your tastes in any given volume. Ranging from the simple ‘doubler’ calculators to more the specialised DIY multi flavour recipes. Many can be found online and at a few Australian vendor sites, applications are also available for Android and on iTunes for IOS systems. See entry under Electronic Pipe. See entry under European Free Vaping Initiative. One of The most popular styles of Personal Vaporiser originally developed by the Joyetech company. 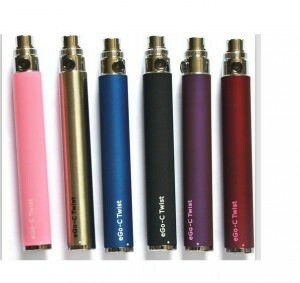 They are available in a variety of colours, styles and sizes and in both fixed and variable voltage models. An alternative thread for connecting a mod to an atomiser, originally introduced by the Joytech company. 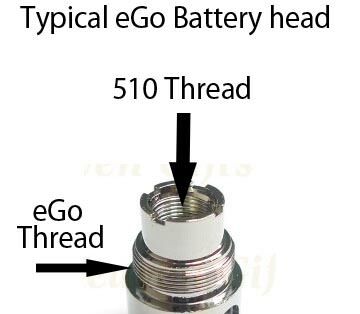 Unlike the 510 connection, it used a male thread on the mod/battery and a female thread on the atomiser. The thread is M12 x 0.5mm. Fine strands of silica(glass) that have been woven into a hollow cord. It is used as wicking material for atomisers. 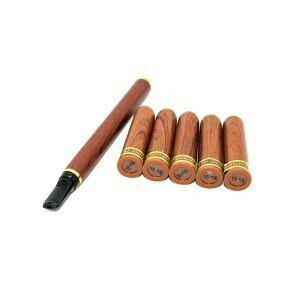 A Personal Vaporizer designed to look like a cigar. A kit designed to provide a new vaper with all they need to start vaping. These typically include one or sometimes two eGo style batteries, clearomisers, a charger and sometimes e-liquid. A Personal Vaporiser designed to look like a tobacco pipe. Electronic Non Nicotine Delivery Systems. A personal vaporiser using e-liquid that does not contain nicotine. An excipient is a natural or synthetic substance formulated alongside the active ingredient (e.g. nicotine), included for the purpose of long-term stabilization, bulking up solid formulations that contain potent active ingredients, or to confer a enhancement on the active ingredient, such as facilitating absorption, reducing viscosity, or enhancing solubility. FlavourArt. A manufacturer of flavour concentrates used in e-liquid. Framework Convention on Tobacco Control by the WHO. See entry under Food & Drug Administration. See entry under Filler Material. An absorbent material placed inside a flavour cartridge or cartomiser, designed to hold e-liquid and regulate its flow to the atomiser. A substance used to add flavour to e-liquid. Water soluble, food grade flavourings are most commonly used. This occurs when more e-liquid is supplied to the coil than can be vaporised. The indicators of flooding are a gurgling sound and e-liquid leaking from the air hole. The performance of the atomiser is negatively affected. Protecting the public health by assuring that foods (except for meat from livestock, poultry and some egg products which are regulated by the U.S. Department of Agriculture) are safe, wholesome, sanitary and properly labelled. Ensuring that human and veterinary drugs, and vaccines and other biological products and medical devices intended for human use are safe and effective. Protecting the public from electronic product radiation. Advancing the public health by helping to speed product innovations. See also entry under GRAS. A harmful chemical produced when e-liquid is burned (as opposed to being vaporized). Also present in exhaled breath and cigarette smoke. An RBA that uses stainless steel mesh as a wick instead of the typical silica and sits on top of a tank (usually glass) with one or more holes in the deck leading into the tank. A clearomiser which has a glass tank. A photo of the Personal Vapouriser you are using today, usually including the bottle of the e-liquid contained in the atomiser. Used as a way of showing off your vaping equipment online. A term used by manufacturers who offer cartomisers, clearomisers, and/or replacement pre-made coils. Typically High Resistance is 2.8 Ohms and above. Heat Not Burn. Devices that heat tobacco leaf to release vapor, but do not burn it. These devices expose the user to less harm than burning tobacco, but more than Personal Vaporisers. Someone accident prone with mods, or someone who generally breaks them through neglect or misuse. Areas of excess heat on the atomizer coil. Caused by poor wicking, or poor contact between the wick and the coil, hot Spots are a known cause of Dry Hits. 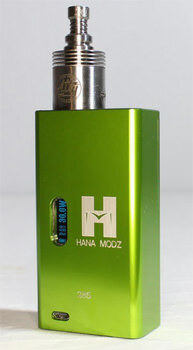 A mod and atomiser (usually Genesis style)manufactured in one inseparable unit. Designation code of a Li-ion battery safe chemical composition with a cathode made of Lithium Manganese Oxide (LiMn2o4). A unit of power used in temperature protected mods. It is equal to the energy transferred (or work done) in passing an electric current of one ampere through a resistance of one ohm for one second. 1 Joule is equal to 1 Watt per second. A ferritic iron-chromium-aluminium alloy (FeCrAl alloy) for use at temperatures up to 1400°C (2550°F). The alloy is characterized by high resistivity and very good oxidation resistance. 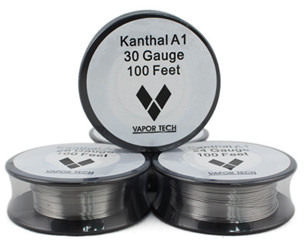 Kanthal is the trademark for a family of iron-chromium-aluminium (FeCrAl) alloys used in a wide range of resistance and high-temperature applications. The most common variety used in atomisers is Kanthal A-1 in gauges between 22 – 32. A Variable Wattage circuit board designed (originally by evolv) to be inserted into a Mechanical Mod between the battery and the Top Cap, converting it into a Variable Wattage device. See entry under Lithium-Ion Polymer Batteries. See entry under Lithium-Ion Batteries. A member of a family of rechargeable battery types in which lithium ions move from the negative electrode to the positive electrode during discharge and back when charging. Li-ion batteries use an intercalated lithium compound as the electrode . 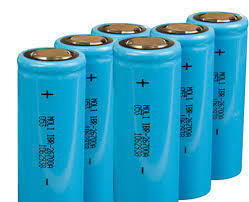 Lithium-ion batteries are common in consumer electronics. They are one of the most popular types of rechargeable battery for portable electronics, with one of the best energy densities, no memory effect, and only a slow loss of charge when not in use. 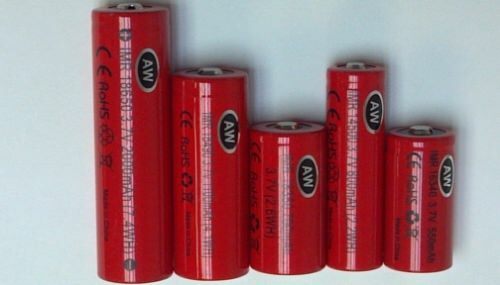 Lithium-ion polymer batteries, polymer lithium-ion or more commonly lithium polymer batteries (abbreviated Li-poly, Li-Pol, LiPo, LIP, PLI or LiP) are rechargeable (secondary cell) batteries of lithium-ion technology in a pouch cell format. A term used by manufacturers who offer cartomisers, clearomisers, and/or replacement pre-made coils. Typically Low Resistance is between 1.5 – 2.0 Ohms. A feature of some Advanced Personal Vapourisers that shuts down the device should the batteries go below a certain voltage (usually around 3.2V). This protects the batteries from damage. An alternative to mouth to lung hits, lung hits are inhales of vapour straight to the lungs. Usually requires massive airflow. See entry under Mouth to Lung Hit. See entry under Mechanical Mod. A Personal Vaporiser that doesn’t have any electronics or wiring. It is usually a metal tube or box (which holds a battery or batteries) with a mechanical switch and a 510 connector with which to attach the atomiser. See Entry under Stainless Steel Mesh. Milligrams per Millilitre. A common measure for nicotine concentration in a mixture of nicotine diluted in excipients. The percentage of nicotine contained within the e-liquid usually expressed in milligrams per millilitre (mg/mL). For example, 12mg of nicotine per mL = 1.2% nicotine. A coil wrapped with an internal diameter of between 1.4mm and 1.65 mm, usually a contact coil. One thousandth of an Ampere. A unit for measuring electric power over time. mAh is commonly used to describe the total amount of energy a battery can store at one time. A battery rated for more mAh will power a Personal Vaporiser for a longer time given the same usage pattern. The trade-off is that batteries with more mAh are generally also physically larger and heavier. Metric unit of measure for one thousandth of a gram. Metric unit of measure for one thousandth of a litre. Short for modification. This originally referred to modifying a flashlight or a battery to be used in vaping, but is now commonly used to refer to any vaping device that is not a cig-a-like. A person who builds custom Mods. Vapour is pulled into the mouth first and then inhaled into the lungs. A similar action to smoking a cigarette. Mouth to lung hits can provide more flavour in the mouth. Master Settlement Agreement. A deal cut between BT and US states in which the states drop legal action and in return BT pays the state an amount of money 'per cigarette sold'. Many states issued bonds against the expected earnings of the MSA. Now that smoking rates are plummeting, they are looking to be out of pocket. A coil wrapped with an internal diameter of been 0.5 and 1.4 mm, usually a contact coil. The New Nicotine Alliance (UK) is an independent, not-for-profit organisation, concerned with improving public health, through a greater understanding of “new” (ie. risk-reduced) nicotine products and their uses. The New Nicotine Alliance Australia is a not for profit organisation working towards improving public health through a greater understanding of risk-reduced nicotine products and their uses. It receives no funding from tobacco, e-cigarette or pharmaceutical companies or their affiliates. See entry under Nickel Wire. 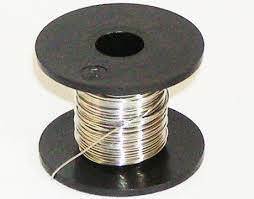 Also known as Nickel Chromium wire, it is a type of resistive heating wire used in many electric heating devices. It is typically made from nickel, chromium, and (often) iron. A common ratio is 80% nickel to 20% chromium. Generally considered the inferior of the two commonly used atomizer coil materials. See Entry under Nichrome Wire. A type of resistance wire for making heating element coils. Supported by some Advanced Personal Vaporizer for use with Temperature Protection. An alkaloid found in the Solanaceae family of plants (such as potatoes, tomatoes, and eggplant) and other human plant foods. It is a stimulant similar to coffee. It constitutes approximately 0.6–3.0% of the dry weight of tobacco and is present in the range of 2–7 µg/kg (micrograms per kilogram) of various edible plants, (i.e Eggplant). 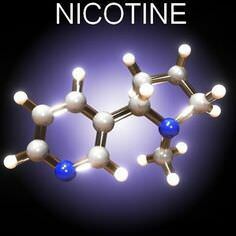 Nicotine was widely used as an insecticide in the past, and may still be in use especially in organic farming. In lesser doses (an average cigarette yields about 1 mg of absorbed nicotine), the substance acts as a stimulant in mammals, while high amounts can be harmful (see recent information on toxicity). This stimulant may be a major contributing factor to the dependence-forming properties of tobacco smoking, although there is some doubt of the addicitve properties of nicotine by itself without the other chemicals present in tobacco leaf such as monoamine oxidase inhibitors (MAOIs). NRTs have been approved for long term use by the TGA. Nicotine, usually mixed with PG and/or VG, and food flavouring for vaping purposes. The amount of nicotine present in a bottle of e-liquid. It is usually expressed in mg/ml. Your nicotine level is the amount of nicotine in your e-liquid, required to keep your cigarette cravings at bay. Also see entry under nicotine base. Generally refers to pharmaceutical products containing nicotine such as patches, gum, lozenges and inhalers to be used for tobacco smoking cessation. See entry under New Nicotine Alliance. See entry under New Nicotine Alliance Australia. Typically made from pure nickel, pure silver or an alloy of the two, non resistance wire is really a misnomer as all wire has some resistance. However, non resistance wire has a resistance so low it is negligible when used in atomisers. In atomisers it is used to connect the coil(s) to the positive and negative connections of your atomiser, especially when they are far from the coil/s. This ensures all the power is transmitted to the coil(s) and avoids “hot legs”. 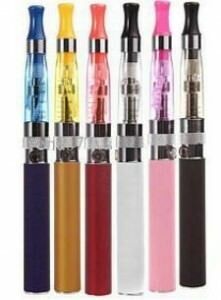 A beginner in the use of personal vaporisers who is migrating from using cigarettes. A person learning about the many products, aspects, procedures, and practices in the vaping world. See entry under Nicotine Replacement Therapy. Ω Symbol. The unit by which electrical resistance is measured, or….. the lower the number the faster the coil heats… which in turn shortens the battery life. The principle that the electric current (Amps) passing through a conductor is directly proportional to the potential difference (Voltage) across it. The constant of proportionality is the resistance of the conductor. The natural process of drawing e-liquid up a wick against the force of gravity. 1. Refers to torching stainless steel wicks [either mesh or rope] to limit conductivity of the steel to prevent short circuits. 2.Can also refer to the discolouring and degrading of an unflavoured nicotine base liquid when exposed to air for long periods. A feature of some APVs that allows the user to vape while charging. 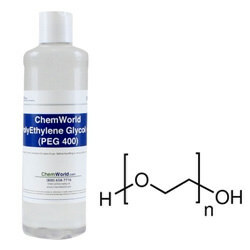 See entry under Polyethylene Glycol. See entry under 2nd Generation E-Cig. A device consisting of a battery and an atomiser containing one or more heating elements or coils. Designed to vapourise e-liquid to simulate and replace smoking. See entry under Propylene Glycol. The English organisation most responsible for administration of stop smoking services & the Personal Vaporisers they provide. Pay It Forward. Passing on unwanted items to vapers in need. See entry under Pure Grain Alcohol. Philip Morris International. A BT company. A Personal Vaporizer that uses replaceable e-liquid/coil cartridges or "Pods"
A synthetic polyether with the formula H-(O-CH2-CH2)n-OH. It is a compound with many applications from industrial (and food?) manufacturing to medicine. Not for home use as there is no way to be certain of Diethylene glycol content by contamination or byproduct of production process. Personal Protective Equipment…. Recommended when mixing any eliquids or nicotine bases. At a minimum, disposable ‘surgical’ style gloves should be worn along with eye protection. E-liquid that is purchased ‘ready to vape’. It can contain nicotine. Potential Reduced Exposure Products. Potential reduced exposure products (PREPs) for smokers are marketed by the tobacco industry as a way for smokers to reduce toxicant intake while continuing to use tobacco. HNB devices are an example of a PREP. Inhaling from a Personal Vaporiser without activating the coil. It is done to ensure the wick is wet and avoid dry hits. An organic compound (a diol or double alcohol) with formula C3H8O2. It is a colourless, nearly odourless, clear, viscous liquid with a faintly sweet taste, hygroscopic and miscible with water, acetone, and chloroform. 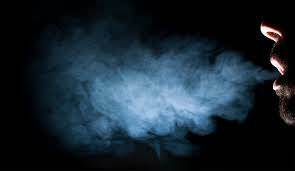 Propylene glycol is considered generally recognized as safe (GRAS) by the U.S. Food and Drug Administration, and it is used as a preservative in food and for tobacco products, as well as being one of the major ingredients of e-liquid used along with vegetable glycerin. Vaporisers used for delivery of pharmaceuticals or personal care products often include propylene glycol among the ingredients they are filled with. 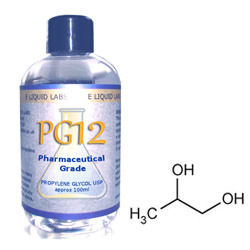 Propylene glycol is used as a solvent in many pharmaceuticals, including oral, injectable and topical formulations, such as for diazepam and lorazepam which are insoluble in water. Propylene glycol, because of it’s low freezing point, is used in anitfreeze as a safe alternative to older additives. A “protected” Li-Ion battery has a small electronic circuit integrated into the cell packaging. It protects against common dangers, such as overcharge, overdischarge, short-circuit (overcurrent), and temperature. A feature built into some APVs that counts the number of time you inhale. Highly concentrated ethanol which has been purified by means of repeated distillation, a process that is called rectification. It typically contains 95% alcohol by volume. An oral nicotine spray by the Nicorette company. It is a TGA approved NRT that contains all four ingredients contained in e-liquid, plus many more including hydrochloric acid!